Mother's Day was yesterday, but only today did I get wind of this. On the plus side - they did not answer Almaza as they always do and make it their raison-d'etre! On the minus side? What on earth were they thinking? 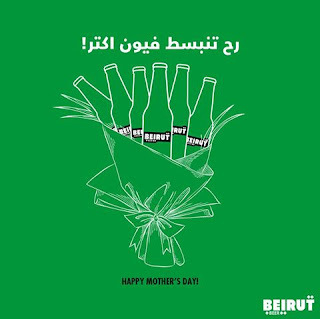 Perhaps it is best Beirut Beer stop thinking on their own and continue their replies to Almaza because the above is - confusing and clueless all at once! Beer for mother's day? Really?